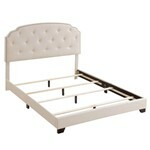 Treat your bedroom decor to an elegant addition with this beautifully upholstered all-in-one style bed. The headboard features subtle, stylish curves at both top corners, accentuated by a clean row of nickel nailhead trim for definition. Diamond-shaped tufting is punctuated by color-matched buttons and stitching for a crisp, pleasant finish. Premium details like soft foam padding and special hinged side rails ensure this tufted bed is as easy to set up as it is to enjoy.